Over the past year, the planning team has been working to develop a Bicycle Master Plan for the city of Vermillion and the surrounding region. This process included an extensive public engagement process, engaging hundreds of stakeholders, hundreds of miles of field work on Vermillion's streets (mostly by bike), and technical analysis of physical condition. 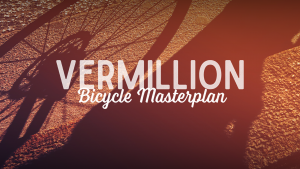 The final product is the Vermillion Bicycle Master Plan. You can access the document by following the link below. A special thanks to everyone that attended the public meetings, served on the committee, and provided feedback online and in person. 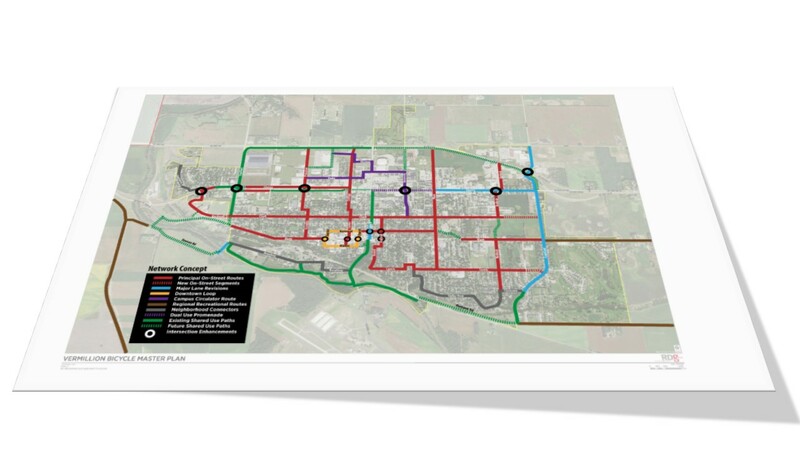 Your participation helped shaped the final document into a plan for the future of Vermillion's bicycle network. Thank you to everyone who attended Monday's Open House event at City Hall! We had a great turn-out, which led to great discussion. If you didn't have a chance to attend the meeting, you can download the presentation here. We've also posted the display boards for your convenience. Once again, thank you for participating in the Open House event. We appreciate your input! Contribute your comments through the "give your input" tab on the website. Attend the open house event on September 10th. Information about this has been included here. 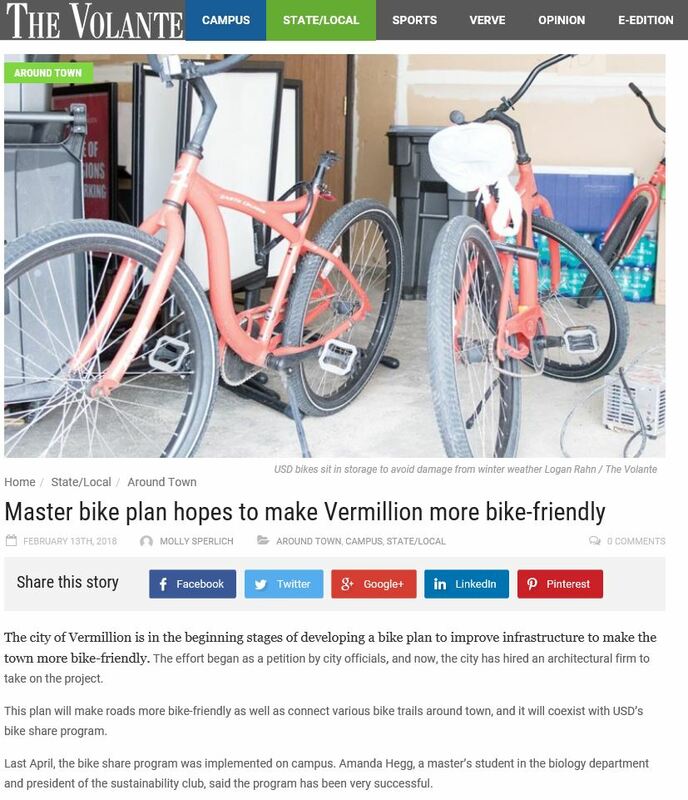 Check out this article featuring the Vermillion Bicycle Master Plan that was published in the Vermillion Plain Talk! 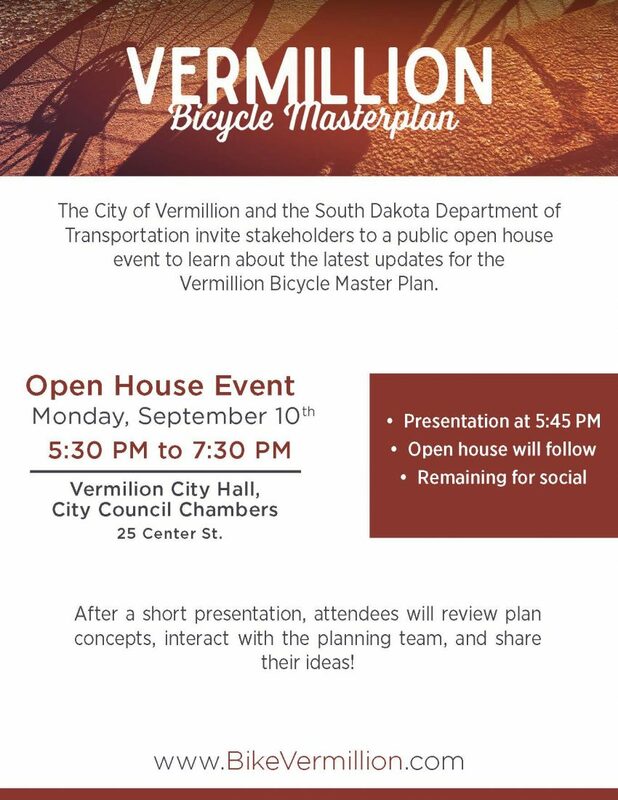 Join the planning team at this public open house event and learn about the most recent updates to the Vermillion Bicycle Master Plan. At the meeting, there will be a short presentation as the planning team goes through the latest news and updates to the plan. 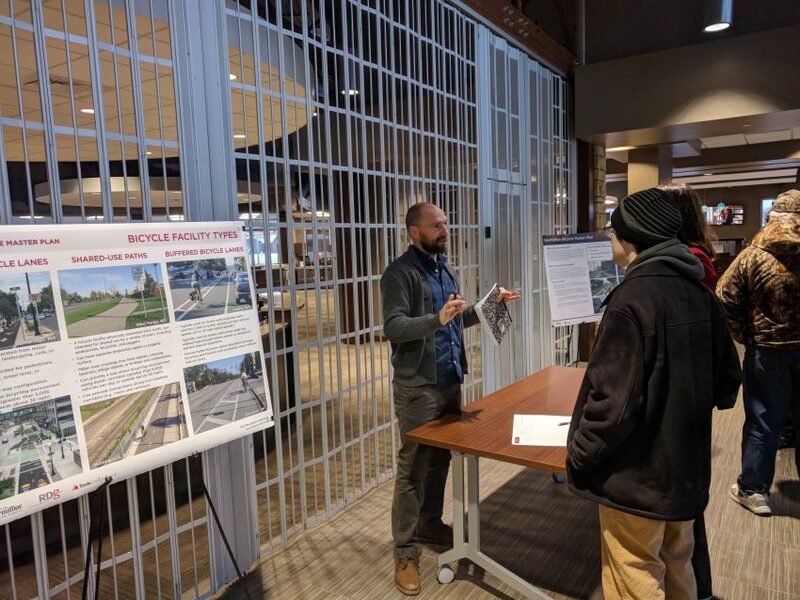 After that, attendees will have the opportunity to view boards and illustrations about making Vermillion a more bike-friendly place, and they'll have the opportunity to provide input and ask the planning team questions about the plan. This is a great opportunity for anyone interested in biking or walking in Vermillion to help shape this plan. You can stay as long as you want and provide as much input as you want. After the event, we'll take the ideas gathered from the attendees and will update this website for those who cannot make it. A bicycle network is beginning to emerge from your input over the past months and through study of Vermillion’s physical environment. On March 22nd, the Study Advisory Committee reviewed a draft network and contributed their ideas and revisions. The next step is to refine the network and to identify the appropriate type of facilities for each segment of the network (i.e. : signage, bike lanes, multi-use paths). The draft bicycle network will be posted to the website once the recommendations of the Study Advisory Team have been incorporated. Thanks to everyone who attended the four neighborhood workshops! 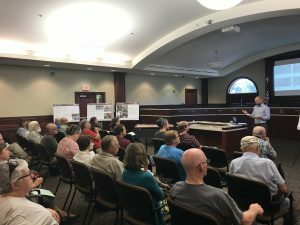 Participants learned about the planning process and shared their insight and ideas for how we can make it easier to ride a bike in Vermillion. Next we use all of the community input to create a bicycle network that brings together a system of multi-use paths and on-street facilities (download the below presentation boards for facility examples) to allow a bicyclist to comfortably ride a bike from place to place throughout town! The Bicycle Master Plan Highlighted in The Volante! Great coverage in the Volante! Join the conversation at an upcoming workshop in your neighborhood! 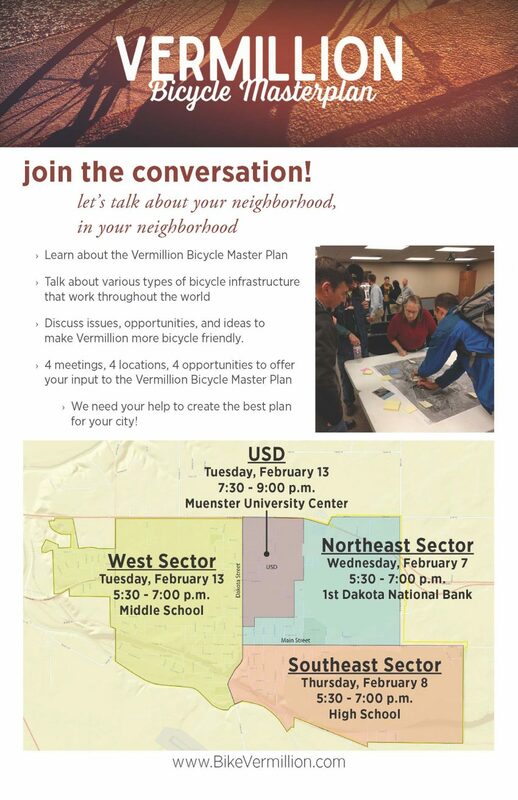 Come learn about the Vermillion Bicycle Master Plan and discuss how to make your area of Vermillion more bicycle friendly. Each of these meetings will be held in a separate part of the city to explore the issues and opportunities related to that part of the community. Come to the nearest meeting to your home or work! 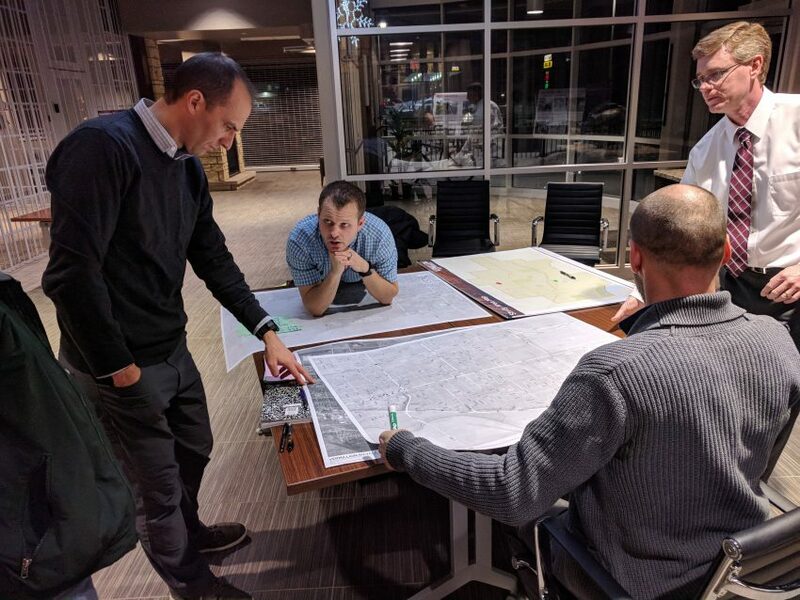 The Bicycle Study Advisory Team met on January 4th, 2018 to review the plan progress and survey results. The team received insights on the characteristic of people who bike in the community, their priorities, and the type of streets and bicycle facilities people feel most or least comfortable using. The team also reviewed existing road condition and result of the interactive map. After a fruitful conversation about the survey and knowledge sharing, the meeting concluded with a discussion about series of upcoming meetings throughout the city. Thank you to the attendees and stay tuned for an update on upcoming meetings!